Please familiarise yourself with the online Report Safety Issue form. All Crew Members, regardless of experience or rank, or invited to use the Report Safety Issue form to report any potential issues that may impact the safety of any personnel, no matter how insignificant they may appear. The RSI is part of our ongoing process to make our forms easily accessible to all SHS Crew Members online. The RSI has been specifically created for ease of use and to be available at all times and locations. The RSI replaces the old paper version and requires no downloading, printing or scanning, is optimised for mobile use and is environmentally friendly. It is important that senior SHS Crew Members use this Report Safety Issue form to report ALL Potential Safety Issues onsite, no matter how insignificant they may appear. The Report Safety Issue form is intended for use when out of the ordinary Safety Issues are identified on a Job that requires an action to ensure the safety of SHS Crew Members and any personnel onsite. By completing the Report Safety Issue form, we are documenting and storing the action taken to minimise the potential risk to Crew Members onsite. 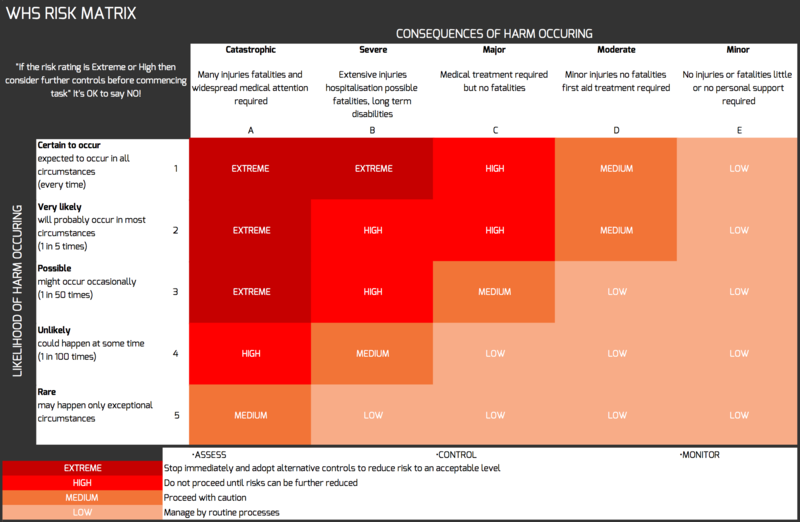 For each Potential Safety Issue on a Job Site, consult the below table to assess the possible likelihood of harm occurring and the consequences of harm occurring. The combination of these two factors will result in a risk rating of extreme, high, medium or low. Example: When a potential hazard has a likelihood of “Possible” and a consequence of “Severe”, then according to the below table, the matrix will return a risk rating of “HIGH”. The Elimination of the Safety Issue is the most effective way to make the work environment and task safer. Substitute the Safety Hazard with another of lower risk. Isolating the Safety Issue is achieved by restricting access to the area/location of the hazard. Minimise the risk by engineering means. Minimise the risk by administrative means. The Report Safety Issue form can filled in by ANY qualified member of the SHS Crew. The Report Safety Issue form is easily accessible on the Show Support website under the WHS heading: Show Support Website > WHS > Risk Assessment and under Feedback.